Built circa 1835 by Augustus and Margaret Wolfe. The log structure had a dual role serving as a lower –end tavern for drovers and teamsters and as a place for the Wolfe family to perform the family trade of tin-crafting. Records indicate that the Tavern provided the bulk of income as well as the living quarters for the family into the early 1850s. Emmanuel Wolfe, the youngest son, assumed ownership of the businesses on the death of his parents. Emmanuel was known for his tinning craft. He was also the town constable and considered by locals to a run a “dry” establishment. This may explain in part why the Tavern declines during this time and becomes a “hotel” with no record of food preparation or liquor operation. 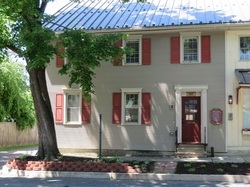 Emmanuel Wolfe is thought to have built the addition to the tavern known as the “tinners addition”. On his death, his widow, Leah sold the property and moved away. A subsequent owner, Samuel Bell, was a very gifted tinsmith and salesman. Unlike Emmanuel Wolfe, who sold his wares from the Addition, Sammy Bell used it as a store for durable goods and peddled his tin-wares from a customized horse- drawn cart. Samuel Bell appears to have been a successful tradesman, but, for reasons now unknown, around 1911 he committed suicide on the second floor of the addition. The Wolfe Tavern, as it has done throughout its history, continues to serve multiple enterprises today.